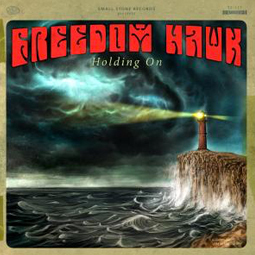 Hailing from the barrier dunes of Virginia, this quartet blends heavy riffs, a rolling groove, and soulful guitar melodies to produce the sound that is Freedom Hawk. Their brand of heavy rock coupled with a high energy live show, leaves many wondering if they’ve stepped through a time warp that has taken them to rock’s heyday of the 70’s. The origins of Freedom Hawk began in 2003 when friends Mark Cave (bass) and TR Morton (guitar; singer) were introduced to Lenny Hines (drums) through a mutual friend. Mark and TR had been jamming together for some time and could not find the right drummer to match what they were playing. Once they brought Lenny into the fold, the two knew they found the drummer they were looking for. Now a trio, the three realized their songs were missing a certain dynamic that would be required to achieve what they wanted to hear. In comes Matt Cave (guitar). Matt had been working with another band in the Virginia Beach area at the time and knew his brother Mark was looking for a second guitar player. After a few successful sessions and the eventual request by his brother Mark to join the group, Matt decided to be the fourth and final addition. This band will make you turn it up real loud driving in your car head bobbing the whole time on the edge of your seat until you reach your final destination. Freedom Hawk’s music slashes away, tearing its way into the ears of all those who listen with original quality matched only to those which have proven themselves in days past. The driving beat and heavy guitars with timeless vocals gives light to a new birth in heavy music, with a ray of excitement allowing you to rock away to Freedom Hawk’s dark music fueled by the sun. Recorded and Co-Produced by Vince Burke at Sniper Studios – Moyock, NC.